Originally an American coastal passenger steamship built in 1913. She was purchased by the US Navy in January 1918 and commission later in that month as USS Narragansett. After being converted for naval use, she crossed the Atlantic in July 1918 to be used as a troopship in the English Channel. 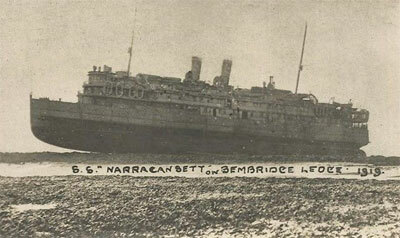 At the end of January 1919 Narragansett ran aground on Bembridge Ledge while en-route to Southampton with over 3,500 people aboard - all were successfully evacuated. She was refloated on 17 February and returned to service after repairs.